The geography of the Santonian seems to be a contentious subject. One version of the African and Mediterranean region is shown here. This map shows the position of the tectonic plates, with modern shorelines superimposed for reference. However, the Santonian was a time of extremely high sea levels -- perhaps the highest ever -- and much of the area shown as "land" would have been covered by shallow seas. You may get an idea of the proportions by looking at the PaleoMap Project map of the Late Cretaceous (Cenomanian). Dr. Blakey's maps of the Late Cretaceous are perhaps the best overall representation. On the whole, the globe was beginning to look quite familiar by the Santonian, with a few exceptions. The Atlantic was narrower than in modern times. In fact, there may be some dispute as to whether the South Atlantic was entirely open yet. Some residual contact between the continental shelves of South America and Africa may have remained. However, the Central Atlantic was certainly open. The situation north of the Central Atlantic is less certain. Probably, an open seaway continued right up to the North Pole through the Labrador Sea. 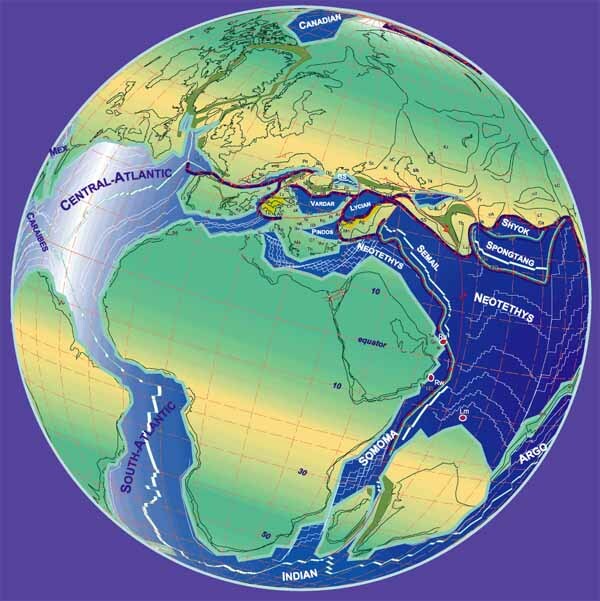 The Atlantic waters were certainly connected with the Pole by way of the North American Interior Seaway, which cut right through the center of the North American continent. South America, and even perhaps Africa, also held substantial inland seas. Although the Atlantic was becoming quite recognizable, Southern Europe was still a confused and poorly understood collection of microplates, most of which were submerged, as were large sections of Eurasia. The Tethys Seaway through this region remained well open, and a strong westerly current swept from the Tethys, out across the Labrador Sea to South America. The Arabian peninsula remained tightly bound to Africa. India, which would one day close the Eastern end of the Tethys, was still far away. At this point in time, India was just separating from Madagascar and beginning its sprint (by geological standards) toward South Asia. Eastern Asia had, by this time, consolidated, although Japan was probably still well to the South of its present position, perhaps just north of the equator. Australia was firmly locked to Antarctica, which was a bit east of its present position. The Pacific was far larger even than its present size, since most major land masses were still fairly well bunched near their Pangean positions. Across the Pacific, the Sevier orogeny was beginning to build the Rocky Mountains in earnest, just as the Andes were becoming a major mountain chain in South America. The present Central America was open ocean. However, North and South America may have been sporadically joined through the Caribbean Arch. Image: from Geodynamic evolution of the Alpine Tethys. ATW030206. The Santonian may have been an age of storms. This speculation is admittedly our own, but there are several, independent lines of evidence that point to this conclusion. First, several conditions were extremely favorable to the formation of cyclonic storms. World temperatures were both hot and uniform. There is considerable disagreement about the pattern of temperature change in the Late Cretaceous, but there is no doubt that it was very warm by modern standards. The Santonian is particularly noted for its even temperatures. That is, the average temperature varied little from pole to pole. It is not clear why this should be so, but the evidence from isotope ratios and the distribution of planktonic microfossils (and dinosaurs, for that matter!) is very clear. We may add to this mixture the highest sea levels the world had ever experienced, at least during Phanerozoic times. The net result is millions of square kilometers of open ocean, much of it shallow and easily warmed, baking to temperatures over 26.5° C., the critical water temperature for hurricane formation. Because temperatures were hot, humid, and uniform, we would be unlikely to see temperature inversions or complex upper air flows (causing vertical wind shear), both of which tear hurricanes apart before they can form. Second, the Santonian was notable for the controversial phenomenon of black shales. Black shales are dark layers of poorly oxidized decomposed organic matter on the ocean floor. There has been much discussion of the reasons for supposed Ocean Anoxic Events (OAEs) which caused these materials to accumulate. The supposition generally is that hot, uniform ocean surface temperatures created very stable layering of the oceans, depleting the oxygen in cooler deep ocean waters. However, OAEs seem to be made up of very short intervals of anoxic accumulation. We will not get far into this highly technical debate. The point we wish to make is that one possible reason for the perceived pattern of OAEs is that organic matter accumulated in large bursts and was buried quickly, before it could decompose. This might occur where giant storms washed enormous amounts of continental plant material into the ocean within days. This hypothesis accounts for both the presence and pattern of black shales. It also accounts for recent findings in Venezuela which show long periods of black shale accumulation outside the established Atlantic OAEs. Venezuela is roughly where one might expect ordinary tropical storms to make landfall in the Santonian. The presence of black shales in this region, outside the known temporal range of OAEs is consistent with hurricane events as the root cause of black shale accumulation. Third, we know of another direct measure of storm activity, this time from North America. Dr. James Lamb of North Carolina State University has sampled Santonian vegetation in the Southeastern United States and along the north coast of the Gulf of Mexico. He finds that the northern Gulf differs from most contemporary sites because the tree-sized vegetation is dominated by pines. He believes that this is due to the influence of storm activity which periodically cleaned out the entire crop of standing trees, allowing the faster-growing pines to maintain an unstable dominance over angiosperm trees in this region. If correct, this provides relatively direct evidence of very large storm activity on a reasonably regular basis. Much of the recent literature has been devoted to examining the relationship between OAEs and long cycles in Earth's orbit around the sun. This may well be the case, as these cycles have large, if poorly understood, effects on Earth's weather. But whatever the root geophysical cause, we suggest that the immediate cause was sudden accumulation of vast amounts of organic debris through hurricane activity. The climatic conditions and physical evidence point to the Santonian as an age of violent storms. ATW030205. "The reconstruction of this fauna assemblage is based on a highly fossiliferous soft Santonian chalk on the Kent coast. Faunas of this general composition occur throughout much of the English Upper Chalk, but elsewhere faunal densities are very much lower. The chalk has been intensively bioturbated, but is so pure that burrow outlines are difficult to detect. Bottoms were probably thixotropic or semi-fluid, and the faunal elements present show adaptations to this habitat. All but the largest aragonitic organisms are absent. Benthic elements frequently adapted themselves for living on soft bottoms: they sometimes developed long spines to spread the weight of the shell, as in the case of the pectinid Spondylus [h], or club-shaped spines, as with the cidarid echinoid Tylocidaris [q]. Inoceramids are scarce; when present they have often developed a bowl-like lower valve, or are vastly expanded and flattened. Shell debris provided hard substrates which were heavily encrusted by bryozoans [m], serpulids and oysters; they may also have provided a substrate for some brachiopods. Other brachiopods such as Cretirhynchia [o], lay loose on the sediment surface when adult. Echinoderms are a prominent element of these faunas and shown here are Micraster [d], an infaunal or semi-infaunal deposit feeder; Conulus [c] and Echinocorys [c], which probably lived partly buried, ploughing through sediment and feeding on detritus; the cushion star Mitraster [g] and the crinoid Bourgueticrinus [f]. Nekton are represented by the giant ammonite Parapuzasia [a] which reaches a diameter close to 2 metres, and by teeth of the mollusk-eating fish Ptychodus [p] (tooth), probably responsible for much of the fragmentation of inoceramids and other shells." Although these huge marine lizards had only first appeared a few million years earlier, they had already by Santonian times attained a great ecological diversity. The three subfamilies continue and each are well represented in the Niobrara Chalk. 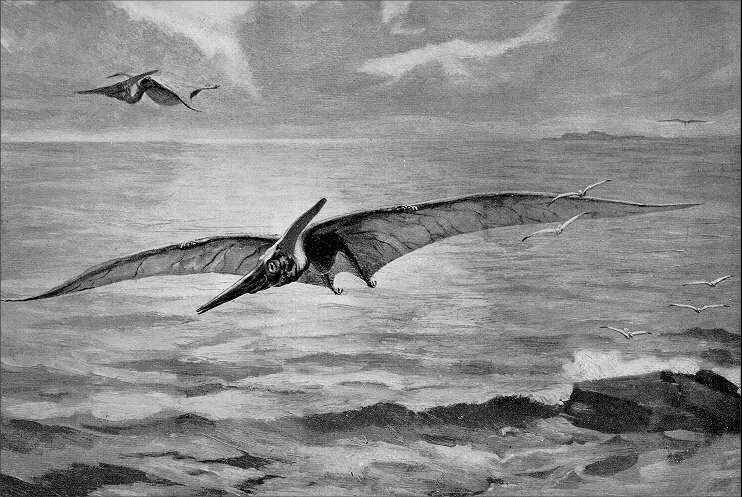 Throughout the Cretaceous, pterosaurs grew larger, while the ecological niche of smaller fish and insect-eaters that during the Jurassic was occupied by Rhamphorhynchid and other small pterosaurs is now occupied by true birds. It can be assumed that Santonian dinosaurs were not very different to those of the preceding Coniacian age, but seem to be poorly represented in the fossil record. Mongolian sediments seem to be either older (Coniacian or at latest Early Santonian) or younger (Middle Campanian onwards), although admittedly the stratigraphy is still uncertain. Brazilian dinosaurs may also tentatively be of Santonian age although again the dating is not certain. The Nequen Formation of Argentina may be either Coniacian or Santonian. So the only certain dinosaurs of this age are a few rare specimens from the Niobrara that were washed out to sea before being fossilized, and even their the dating may be anywhere from Middle Santonian to Early Campanian.